Did you know that dogs need vitamins too? It’s easy to think otherwise especially when most vitamin products are designed for human consumption only. However, for a dog lover who adores their pooch to bits, this is a topic you should definitely be interested in. Dogs get their vitamins from the food they eat. However, a lot of these vitamins are lost when the food is cooked in heat or commercially processed. Plenty of dog owners have opted to switch their dog’s diet to a raw one, but how many of us have the time or money to maintain this new diet? There is nothing wrong with feeding your pup commercially bought kibble. Only that you may have to fortify his diet with multivitamin supplements to make up for lost vitamins. Fortunately, there is an easy way to bundle all these vitamins and feed them to your dog in one serving. And we will get to that. For now, let’s talk about the benefits of vitamins to dogs. Vitamin A is an essential fat-soluble vitamin that helps dogs, especially puppies, grow healthy teeth and bones. In addition, the vitamin plays a big role in forming mucus membranes, soft body tissues, as well as the dog’s skin and coat. Vitamin A is abundantly found in liver, eggs, fish oils, and some vegetables. Vitamin E or tocopherol functions as an antioxidant and also helps in the formation of red blood cells. Moreover, Vitamin E acts as a catalyst for the absorption of Vitamin K.
Vitamin C is widely known as a vital nutrient for maintaining healthy teeth and gums. The vitamin also speeds up the wound healing process, aids in the absorption of iron, and helps maintain healthy body tissues. Luckily, dogs do produce their own Vitamin C in the Liver. Nevertheless, a little supplementation never hurts and in some cases, it might be necessary. Vitamin B6 or pyridoxine aids in the formation of red blood cells and is part of the core vitamins required in catalyzing various chemical reactions at the cell level. Also, nutrition experts link Vitamin B6 to the healthy functioning of the brain. Just like vitamin A, Vitamin B6 is also obtained from organ meat such as liver, heart, and kidneys. In plants, the vitamin is available in wheat bran, brewer’s yeast, wheat germ, and molasses. Vitamin D is absorbed through the skin by humans but not so much for dogs. As a result, your pup can only supplement with Vitamin D through his diet. Vitamin D helps in the absorption of calcium and phosphorus. The vitamin also helps in the formation of healthy teeth and bones. Foods rich in Vitamin D include fish oil, butter, eggs, liver, oatmeal, dairy products, sweet potatoes, and mackerel. Vitamin B12 is important in maintaining a healthy metabolism in the body. It also helps in increasing the number of red blood cells in the blood as well as maintaining a healthy nervous system. Granted, it can get really hectic ensuring that your dog gets all six vitamins at once. A raw diet of organ meat like liver and kidneys will give Charlie the vitamin A and B6 he requires. But what if Charlie doesn’t like almond nuts or sunflower seeds which are rich in Vitamin E? A great alternative is to feed your dog healthy supplements alongside his normal diet. Which begs the question, which supplement product on the market carries all these essential vitamins? 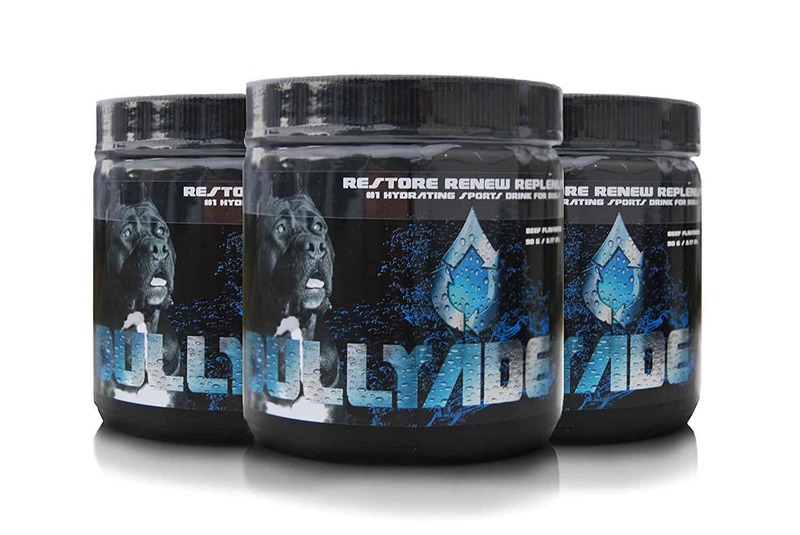 Bullyade is a pet supplement packed with all the multivitamins and electrolytes your dog needs. Initially, Bullyade was developed as an organic recovery solution for dogs suffering from Parvovirus. Today, Bullyade not only helps sickly dogs recover, it also ensures that your pup remains healthy and happy for the rest of his life. Bullyade packs all the necessary vitamins- A, E, C, B6, D, and B12- required by both recovering and healthy pets. In this product, your dog will be getting about 2 IU of Vitamin E, 1000 IU of Vitamin A, 0.15mg of Vitamin B6, 100 IU of Vitamin D, and 0.5 mcg of Vitamin B12. You will never have to worry whether your pooch has enough multivitamins in his body. As a bonus, your dog will benefit from other vital minerals such as calcium, phosphorus, potassium, iron, Zinc, and Magnesium. 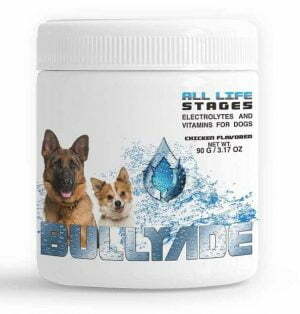 Bullyade also packs nutrients like Niacin, Riboflavin, Manganese, Iodine, and Copper. 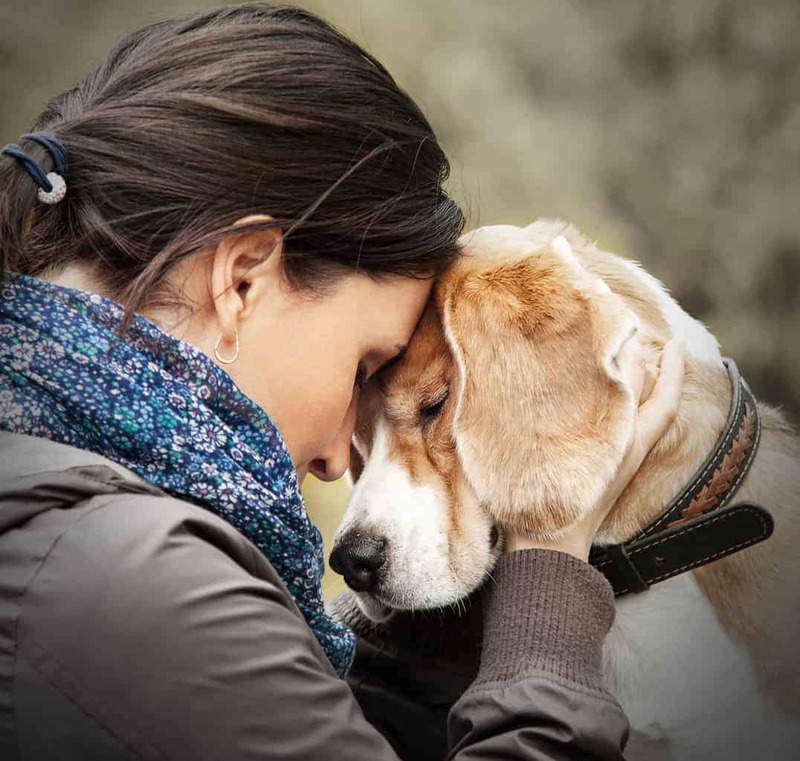 What can Bullyade do for your canine pet? Bullyade helps replenish the electrolytes and vitamins your pup loses when he falls sick. Besides providing relief from parvovirus, this supplement also helps alleviate the symptoms of diseases like Coccidiosis and Pet diarrhea. Bullyade is an amazing product for dogs living active lifestyles. It delivers the electrolytes and multivitamins required by military dogs, sports, dogs, police dogs, as well as competition dogs. Also, dogs get dehydrated faster than humans so Bullyade will not only keep them hydrated but boost their health as well. 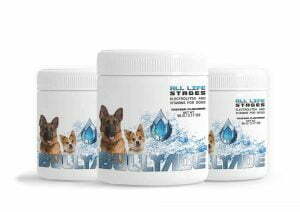 Here is the best part, your dog will love the taste of Bullyade in his drinking water. 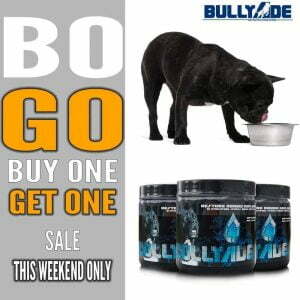 Bullyade comes in two flavors, chicken and beef, that will definitely make Charlie slurp at his drinking bowl with much gusto. Whether your dog is suffering from Parvo, dehydration, heat exhaustion, or a weak immune system, Bullyade packs all the electrolytes and multivitamins to replenish his health. Bullyade also tastes great, so your pooch will always look forward to quenching his thirst.